Q. Is a referral needed for physiotherapy? A. No. Physiotherapists are primary health care providers which means a referral is not required. Some Extended Health Plans request that you obtain a referral prior to treatment if you are going to be claiming reimbursement. Please check your plan for specific details. A. 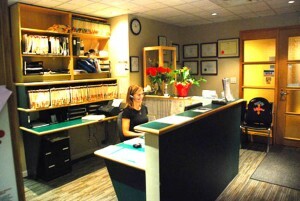 The clinic accepts cash, cheques, Interac, Visa and Mastercard. We request payment at the time of each visit. Q. Can I cancel an appointment? A. We understand that plans can change or urgent situations arise. If you need to cancel an appointment please give us 24 hours notice. Your time with your therapist has been scheduled especially for you. Any cancellations with less than 24 hours notice may result in full service charges. For late arrivals we are pleased to offer you the remaining time allotted for your treatment or consultation but your appointment will end at your scheduled time so as not to extend into the next clients appointment. Q. Where is the clinic situated? A. In the heart of Kitsilano on the second level of the Wholefoods building, on 4th Avenue at Vine. Q. What about parking and access? A. One hour of free underground parking is available under the building. The entrance is on Vine street (opposite Safeway) and there is convenient elevator access to the clinic location on the second level.